I have more than just homemade bars, check out more recipes at the end of the page. Pan bars are a quick and easy item to bring to a family function. My old fashioned bar recipes go back 60 years and still the best-tasting bars I've come across. Try toffee bars, rhubarb bars, raspberry bars and more below. PREHEAT oven to 350 degrees, and spray the bottom of a 9x13 inch pan. Melt butter in a pan on the stove, and add the crushed graham crackers, cinnamon and nuts. Mix well and press into the bottom of the prepared pan. Pour the sweetened condensed milk over the crust. 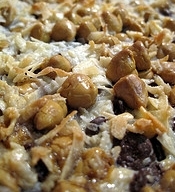 In a bowl, mix the coconut, chocolate and butterscotch chips together and sprinkle evenly over the crust. Bake for 25 to 30 minutes, or until lightly browned. Cool and cut into small squares. Now stand back because they may knock you down to get to these. PREHEAT oven to 350 degrees. Grease and flour a large cake pan or jelly roll pan. Add sugar gradually to egg mixture and beat well. Add flour, water, baking powder and vanilla in usual manner. Stir in nuts and dates. Bake for 15 to 20 minutes, or until a toothpick inserted in the center comes out clean. Cool and cut in finger type bars. Roll in powdered sugar. Combine above ingredients and beat until creamy. Place in the oven for one minute. Remove and run knife through dough to marbleize. Bake for 12 to 14 minutes more. These homemade bars are the Rice Krispie bars with Nutella. In a dutch oven over medium heat, cook syrup, sugar and Nutella, stirring often until sugar is melted. Remove from heat and add cereal. Toss well, coating all cereal with mixture. Put in prepared pan and pat down to even layer. Cool 30 minutes and cut into 20 bars.